To the casual observer, investing is nothing like the exciting game of basketball. Instead of evaluating a player’s jump shot or ability to slip a screen, VCs are looking at financial statements or pitch decks. Upon closer inspection though, I’ve realized that running an NBA basketball team and venture capital investing are remarkably similar. They are both highly competitive games of skill and chance. The games involve the allocation of scarce resources and have power law dynamics for returns. I’ve been a basketball fan almost from birth, as I was born in Boston the same year Larry Bird and the Celtics won the NBA title. My interest in the NBA has expanded over the last couple of years, and it has to do with NBA “stars” most people probably have never heard of — men like Sam Hinkie, Daryl Morey, Danny Ainge and others in that vein. They are NBA general managers, and they make the important personnel and capital allocation decisions for constructing their respective teams. I’ve become fascinated by the game behind the game of the NBA. Plenty has been written about how data and analytics have transformed basketball over the last several years, leading to the smaller lineups, faster pace of play and the supremacy of the three-point shot. But I think there are also some very important lessons that all investors, but especially venture capitalists, can glean from the NBA GM’s allocation of scarce resources, and the decision science behind those allocation decisions. *Almost* 40 years of NBA Finals appearances in eight words: Magic, Bird, Jordan, Hakeem, Shaq, Duncan, Kobe, LeBron. Basically, if your team has one of the eight guys that Hinkie mentions, and barring playing against each other in the same conference, you are making the NBA finals. Most of those players also played their entire career, at least the part with the highest performance output, on one team. The exceptions being 1) Shaquille O’Neal, where the Orlando Magic blew it, and then later, Kobe forced the Lakers to trade him and 2) LeBron and “the decision”. Put differently, almost all those players, played their best years with the same team that drafted them. 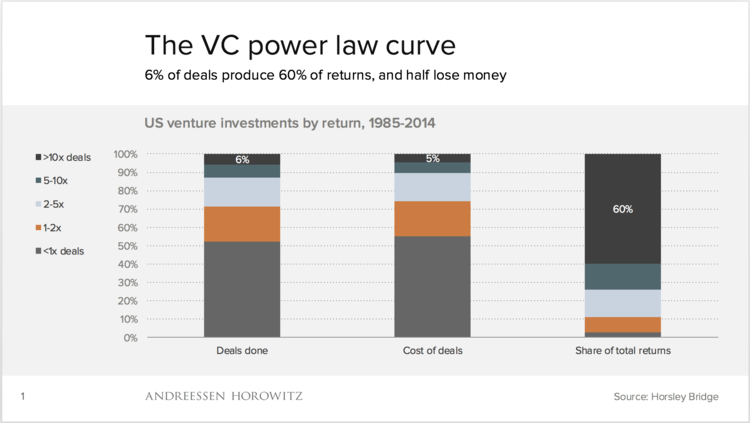 Venture capital returns also follow power laws. Between 1985 and 2014, Horsley Bridge, a leading fund of funds, found that 6% of deals generated 10x+ returns and made up 60% of returns. The dispersion and magnitude of outcomes are heavily skewed to the outliers. This is similar to drafting basketball players. Replace the eight basketball player names that Hinkie tweeted with these: Google, Airbnb, Uber, Facebook, Whatsapp, Instagram, LinkedIn, Zillow. Venture capitalists should be looking for investments that exploit this convexity. Though, it goes without saying that investing in earlier stage companies increase the convexity of the bet, investing in every early stage company you can won’t improve the portfolio’s outcomes. As a category, Venture Capital underperforms the alternative of just investing it in the stock market. I chose those eight names because I invest exclusively in consumer Internet businesses. They exhibit some common traits that I don’t want to commoditize in this essay, but one could do the same for any stage, strategy or sector, from public markets to consumer hardware startups. For example, if you are a SaaS investor, find the common traits of the following software businesses: Salesforce, Workday, ServiceNow, Box, NetSuite, Veeva, Atlassian, Twilio. Have a hypothesis about where there are outsized returns, test that hypothesis against the historical examples to see if you are right, make a few investments, learn and adjust accordingly. The convexity, and therefore the risk appetite, might be different but the method of creating a process is similar. To read the rest of this blog, view the full post on Medium.